Yesterday was the first day for my beginner watercolor class and you would never know these guys were beginners! I’m not kidding – I was SO impressed – this is going to be a fun 6 weeks with these guys. For week one I talked to them about supplies, color theory, mixing paints, and color charts. 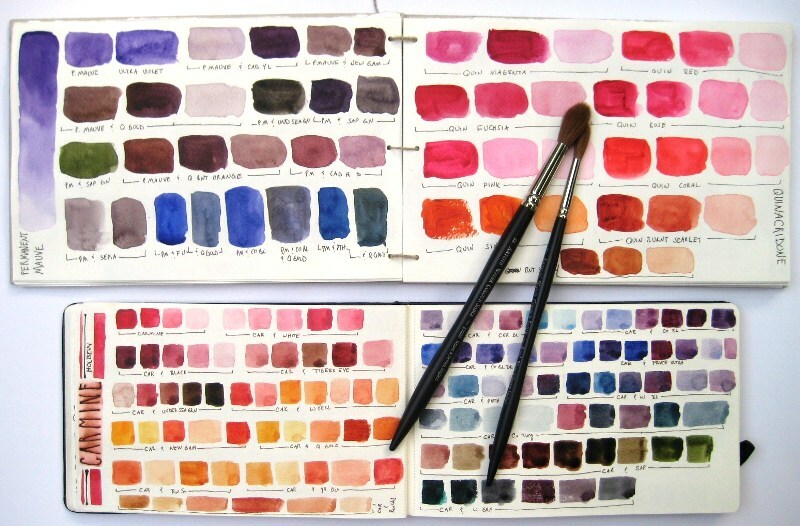 Learning water/paint ratio and how paints get along with each other is super important in watercolor painting, so I taught my students how to do color charts so they could start to learn what the paints do, how much water you need in your brush, and what paints play well with others and which ones like to be left alone. 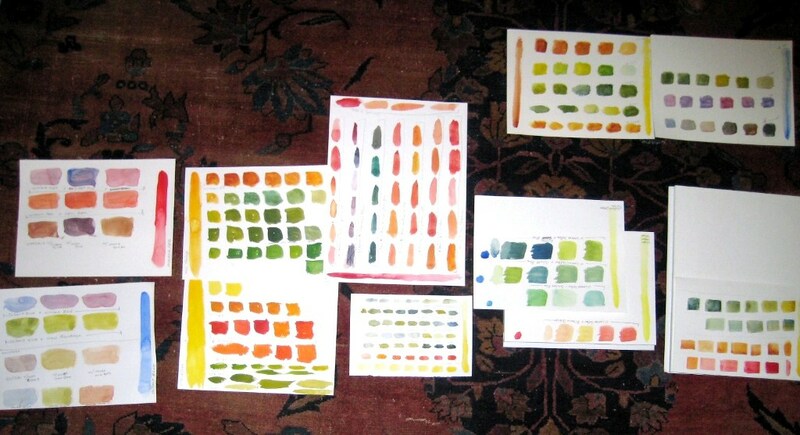 Below is a picture of my class (minus one who had to slip out early) and some of their practice color charts. Next time I’ll take a better picture of their work – the room was too dark where I took this picture – the picture really doesn’t do justice to their work (sorry guys – I’ll do better next time). Once they’ve completed their color charts and made them into journals they’ll look something like the last picture. I’m hoping to do a post once a week of my class and their progress. 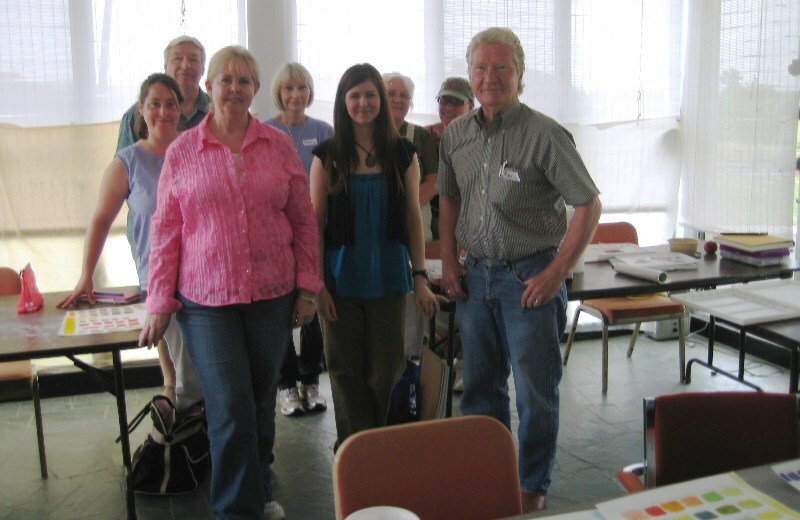 Are you planning another workshop? We could not make this one. Chelsea and I really want to take your class! The workshop I’ve been blogging about I didn’t teach – I attended it. But the classes I’m teaching are for 5 more weeks. I’m not sure if I’ll be doing another beginners class after this one or not – just taking things one step at a time. I would LOVE to have you two in one of my classes though! Miss you guys!!! Would love to see one closeup of one of your swatch pages. These look like a pretty interesting way of doing what can be a boring task. Thanks. They are a lot of fun to work on. Any time I get a new color I do my color charts in my journal so I have all the info. recorded – it’s very handy! You should be able to click on the picture to see it larger Donna – let me know if you want me to e-mail an even larger picture to you so you can see details.